So you want to go fish for catfish. Great, they are a great fish to go after as they live in just about all waters in the U.S. But what is the best bait to catch them on and how do you fish for them? Well, there are as many opinions on this as there are refugees trying to cross the board of the United States. I have been fishing for over forty years. Here are some of the best baits and techniques I know of to catch catfish on. The first thing that you must address before deciding what type of bait to use; is what type of catfish you are you trying to catch. Because what type of bait you choose, depends on what type of catfish you are fishing for. In the United States, there are three primary types of catfish; Channel cats, Blues cats, and Yellow Cats (also called Appaloosas or Flatheads). Each one prefers a different type of bait. Let's take a look at each of the three species and their eating habits. Channels are scavenger fish. They are the buzzards of the water. Channels like really smelly pungent baits. They will eat anything, but they prefer things with a very strong smell. You can catch channels on a piece of sponge soaked in motor oil, a chunk of Ivory soap, etc, etc, etc. 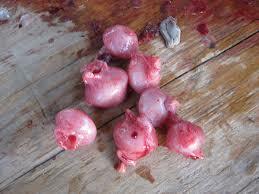 The most common bait is chicken livers, blood baits like Catfish Charlie and stink baits like Catfish Punch Bait. One of the best baits for them though is shad gizzards. You have probably never heard of these because they are extremely rare and if you can find them they are $15 a pint (and worth every penny). If you can throw a net and can find some that are large enough you can harvest your own gizzards out of them (harvested Shad Gizzards JPG). There is no better bait for Channel cats that I know of. Channels can be caught just about anywhere, on any rig. My preferred rig is a simple slip-weight rig, using a 3/8oz bullet weight, a size 8 black barrel swivel, with either a 1/0 Kahle Hook or a #1 or 1/0 Octopus Baitholder Hook. 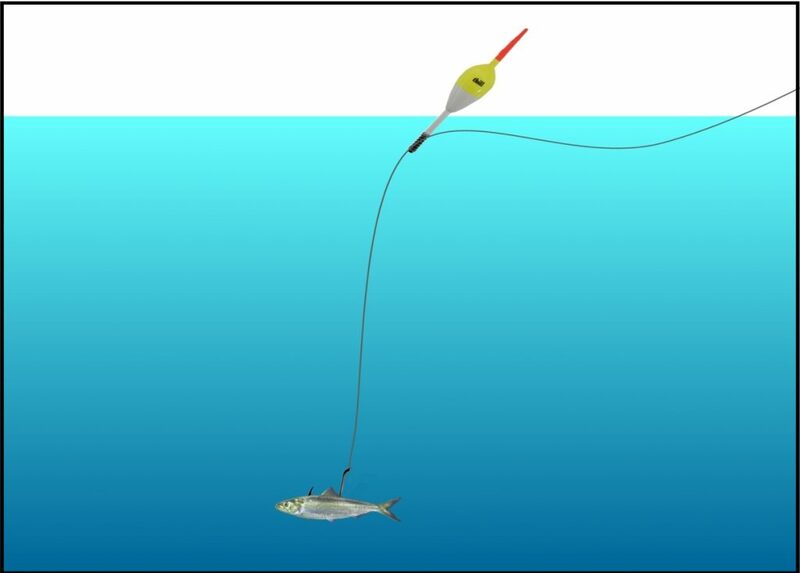 I prefer using a leader of lower strength then my main line, so that if the rig becomes snagged, the hook with break off without breaking the whole rig off with it. Refer to the illustration below. Blue cats are also a scavenger fish, but they do not like stinky stuff as much as Channels. They prefer fresh cut bait, especially fresh shad. They also like to bite bait that is suspended off the bottom. One of the best places to catch blue cats is along a rocky shoreline, like you will find at a lake dam. 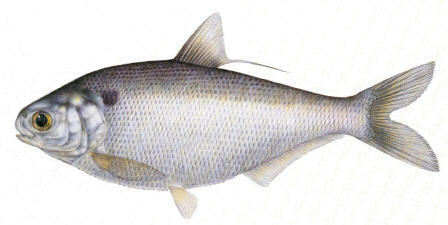 The best way to catch them is float a piece of fresh shad on out about 15 feet from the bank. Tie on a nice crappie Balsa Spring Bobber, with a 4/0 Octopus Hook set down about four feet from the bobber. Cast it out ten to fifteen feet offshore and let it float along. You will catch Blues. 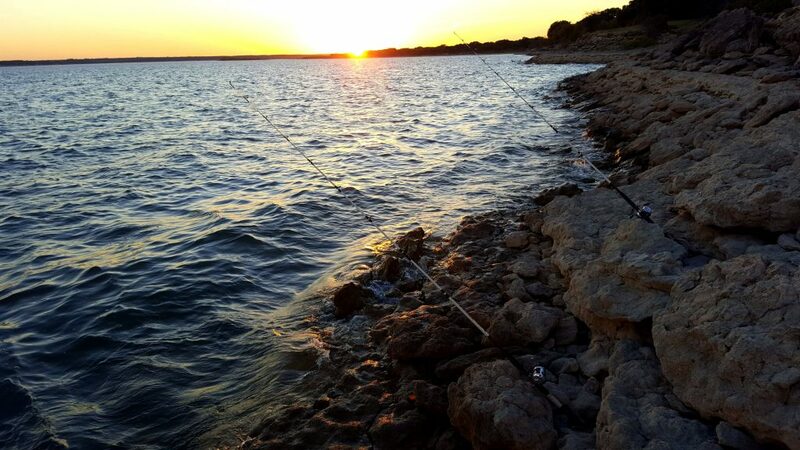 Late evening is an especially good time to fish for them, but they will bite any time of the day. Unlike Channels and Blues, Yellow cats are not a scavenger fish. They are a predatory fish like a largemouth bass. 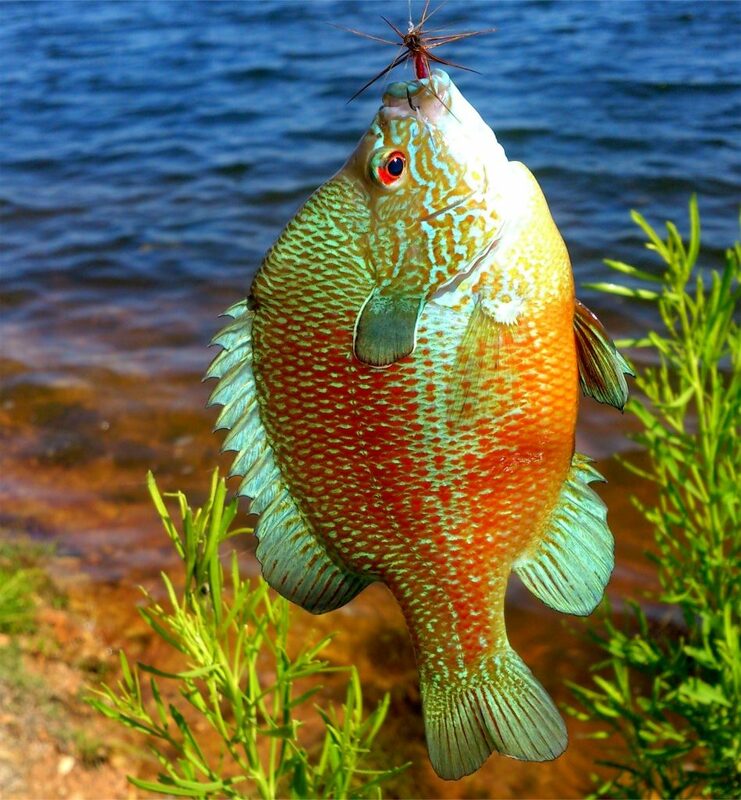 You will never catch one on stinky dead bait, and only very rarely on fresh cut bait. Appaloosas like it to be alive and moving. If it is alive and swimming and they can fit it in their mouth, they will eat it. The problem with Yellow cats is that don't eat every day. They might only eat once or twice a week. You can have the best bait for them on earth and they will not bite it if they are not feeding. Flatheads bite very differently than most fish. They do not just grab it and take off. A Flathead might come in and bite your live bait to kill it first and then just site there for 10 and 15 minutes before picking it up again and eating it. This is why most people miss them. They pull their lines in after the first bite and move the bait from where the Yellow cat is. If you are going to fish for Yellow cats, the rule is, "Go big or go home". You seldom catch a small one and they are aggressive fighters. You need a stout rod like the 7-foot Shakespeare Ugly Stik Tiger. Match this beautiful rod up with a nice fishing reel like the Penn Squall SQL30LW or the Abu Garcia Ambassadeur 7000 C, slap some 40lb monofilament or 80lb braided line on it and you are ready to go. 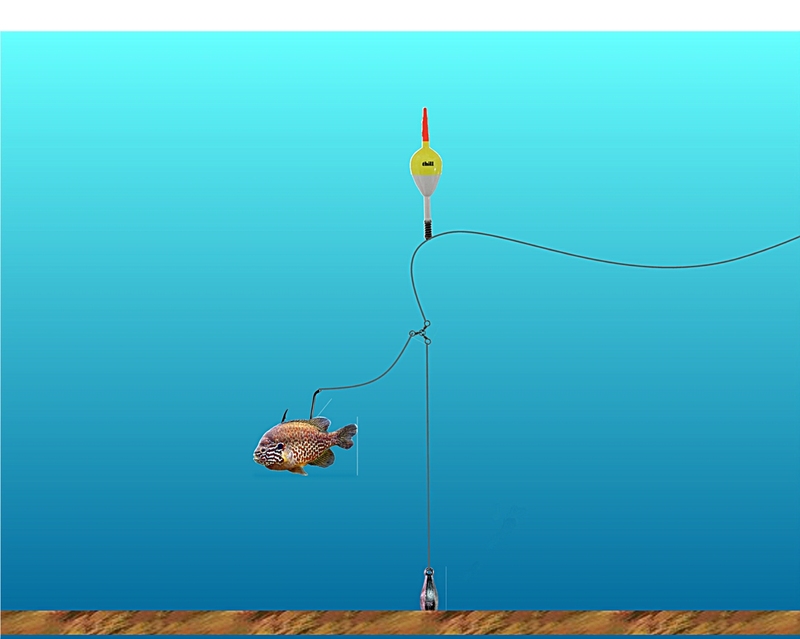 The best setup to use for Flathead cats is called the sunken bobber. With this rig, you will need a heavy lead weight (2 or 3 oz) and a three-way swivel. 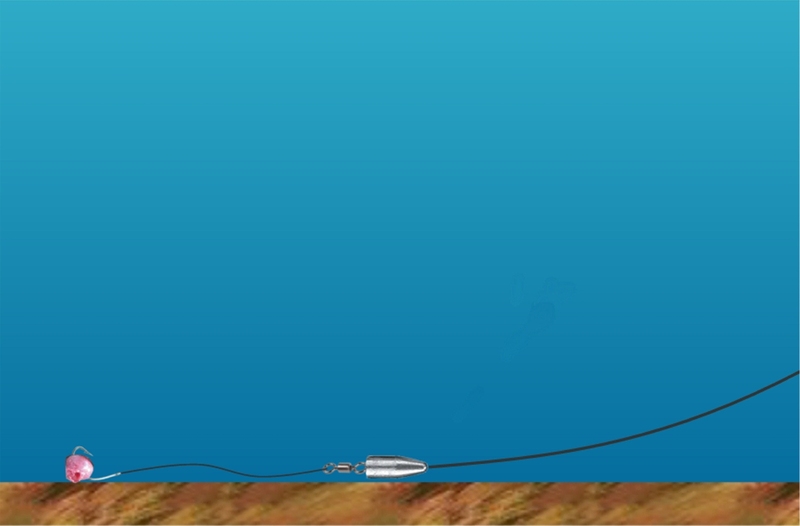 The idea is to keep live fish suspended about a foot off the bottom and allow it to swim freely. Refer to the illustration below. One of the best baits for Yellow cats is a Pumpkinseed Sunfish like the one pictured below, but you can use any live fish as long as it will stay alive and active for a very long time. Bullhead catfish are also another great bait, as well as carp. Fish for Yellow Cats at night in no more than 10 feet of water on a sandy bottom. Appaloosas, do not feed in deep water. They come up into the shallows to feed at night. You will catch most of your Flatheads in less than five feet of water.